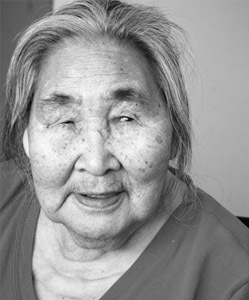 Born in 1925, in Inukjuak. Nastapoka began carving when she was 15 years old, learning by observing the men in the community. Her first carvings were of trade objects: ashtrays, matchboxes, soapstone lamps, seals, and whales. She also made woven grass baskets and dolls. After the arrival of James Houston in 1949, Nastapoka began collaborating on sculpture with her husband, Abraham, who often received credit for her work. Nastapoka and her husband worked on carvings together and, doubtlessly, influenced one another. Her son, Davidee, became an artist, likely as the result of watching his parents.